The H2X Water sports Thrill Shows are events that will feature the world’s top professional Jet Ski racers and freestyle riders, Wakeboarders and other acrobats demonstrating this “next wave” of Action sports. These are the first events of their kind, and the first to fill the nations’ arenas with water! Back flipping, barrel rolling, submarine dives, and other incredible water stunts on their modified watercraft. Wakeboarders, Kneeboarders, Wakeskaters, and flipping and tricking off a huge water jumps and rail slide obstacles. All the riders will perform to a backdrop of music and colored lighting effects, along with………. Bikini Flag girls and acrobatic performers with riders’ on water will add dramatic entertainment value to these already one of a kind spectacles. – Professional Jet Ski riders; Wakeboarders, Wakeskaters and other acrobats. 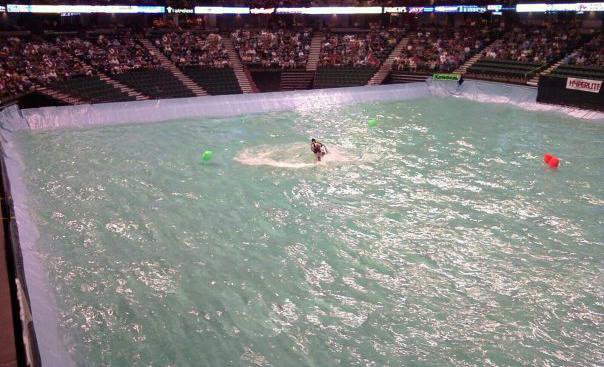 – A half-million gallon portable “man-made lake” filling the Arena floor space. – All Entertainer and production salaries. -KRail (Jersey cement barriers) to encircle the total circumference of the floor space. -Water fill & drainage needs.—water extraction pumps / 2 shop vacuums and 2 floor scrubbers / hoses needed to accommodate each venues hydrants/drains / 10 push brooms and Squeegees for mop up of load out. -Lighting —Spot operators for all house spotlights (4-8) and 1 flown square- truss system with intellibeams and 36 multi colored cans capable of lighting both ends of the pool. -Sound —House PA used, with one cordless microphone for MC and CD player to play show soundtrack. -Staging —one (1) 12ft deep x 36ft long x 6ft tall stage placed at the tunnel end of pool. -Medical —Two (2) EMS unit required; one must have floatable rescue stretcher.